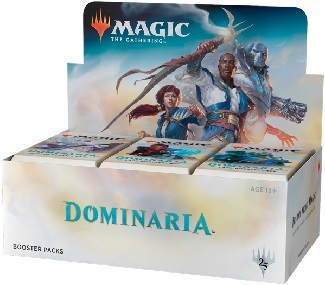 Dominaria is set on the plane of the same name. Returning legendary characters are Teferi, Jhoira and Karn. Dominarias story starts right after the events of Hour of Devastation. Gideon and Liliana have arrived on Dominaria following the Gatewatchs defeat at the hands of Nicol Bolas. Together, they begin a mission to kill Belzenlok, the final demon holding Lilianas contract. Each Pack contains 15 cards. Each Booster Box contains 36 Packs, each with 15 cards.